I have had a Wacom (pronounced "wah-kum") drawing tablet for years. In our district, we had computer lab sets of the Wacom Graphire2, which came out in 2002. The Graphire2 came bundled with software, including an early version of Adobe Photoshop Elements. Having a drawing tablet and a piece of software that easily allowed students to mark up images and create their own art products, opened an entirely new way of using a computer for our middle schoolers. The ability to hold a drawing tool just like they held a pencil was so exciting for them! The tablets still work today with the Mac and Windows machines! However, Wacom has continued to develop the capabilities of their drawing tablets. The Intuos pen tablets line includes various sized graphics tablets that can be used via pen or via touch. Their Cintiq pen displays line includes 13", 22" and 24" computer displays that have the ability to be used as graphic tablets, too! 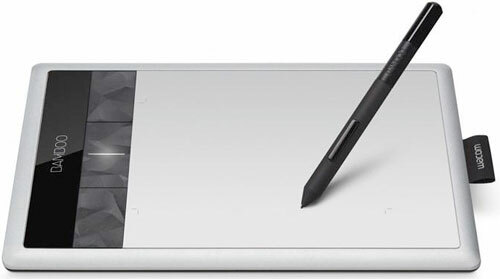 The line of pen tablets that are most affordable, and I feel would work well in a school environment, is the Wacom Bamboo Capture. The Bamboo Capture has a drawing area of 5.8"x3.6" and the Bamboo Create has a drawing area of 8.5"x5.4". The Bamboo Capture would probably work best in a computer lab because of its smaller footprint, but the Bamboo Create, with its larger input area, would work well in support of a graphics lab you might have in your high school. The tablets include the drawing pen and also work as a large touchpad for controlling items on your computer's screen with just your finger. Both of these models have similar features and come bundled with software that would be useful for schools. I have been using a Bamboo Capture, and, in the box, both Adobe® Photoshop® Elements 8 and Autodesk® SketchBook® Express were included with the tablet. 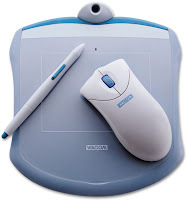 When using Photoshop Elements with the Bamboo Capture, the interactive pen is pressure-sensitive. That means, if you press hard, the lines are darker and if you draw lightly, the lines show up fainter. One of the coolest accessories for these tablets is the wireless module. With a component plugged into the tablet and a USB receiver plugged into the computer, the Bamboo Capture drawing tablet can be used while walking around the classroom. With this accessory, you can control your desktop easily while away from your desk, as well as mark up an image projected from your computer. You can even hand off the tablet for students to solve those tricky math equations from their seats! I have also used the Bamboo Capture in both in my online classes and my virtual presentations. In the online classes, when I hold a synchronous session with the students in Adobe Connect, we have a shared whiteboard. The Bamboo Capture makes it easy for me to mark up this virtual whiteboard. In addition, when using any Webinar tool that allows me to share my screen (Adobe Connect, Skype, Google+ Hangouts, Screenleap, etc. ), I can use the Bamboo Capture to mark up a Web page or slide, edit a student paper, or point out, graphically, items I want to the students to take notice of. Since most of these Webinars are recorded, the actions I take with the Bamboo Capture are saved along with the rest of the Webinar. I have also used the Bamboo Capture when using online screen recording tools such as Screen-cast-o-matic and Screenr, and off-line tools such as TechSmith's Camtasia and Adobe's Captivate, when creating instructional screencast videos for my students or Webinar participants. The Bamboo Dock, which is the desktop software installed with the Bamboo Capture drivers, includes its own suite of software. This software includes Doodler, Free the Bird, and Landmarker. I tried each of them and made a few screenshots and screencasts so you can see the capabilities. "Free the Bird" is a physics game, but also gives the user practice picking a point with the tablet's stylus as well as drawing. Landmarker allows you to enter a zip code or place name and you are presented with the location on a map. You can then mark it up with the stylus and save it out as a JPEG. Bamboo Paper both comes with the Bamboo Dock software and is also available as an iPad app. It allows you to take notes, bring in images, create separate notebooks for your information and much more. You can easily share the notebooks with others, too. Inkwell is handwriting recognition software built-in to the Mac operating system. It turns your handwritten notes into text. Here is a quick clip of this process while using the Bamboo Capture to enter handwritten text. With all of these capabilities, how would you use the Bamboo Capture graphics tablet, wirelessly or wired, in your classroom to support teaching and learning? Submit an idea to the Google Form below (or visit this link) and one lucky (randomly-chosen) contributor, will win their own Wacom Bamboo Capture! The package will include the Bambook Capture, the bundled software, such as Adobe Photoshop Elements, and the Bamboo Dock software, as well as the wireless module! Submit your ideas by June 14, 2013 and the winner will be chosen on June 15, 2013. If you submit an idea, you will be agreeing to let me share that idea on the blog (without your name or email address).